Note that, as of this writing, Android Studio is at version "0.1" so it is still very, very "beta". Launch the EXE installation file and follow the wizard. Done. Open the DMG file and then drag Android Studio into the Applications folder. Done. Check for recent forks based on your Linux flavor, GIT latest version, CRC check for legitimacy, create a Bash script to.....nah, just kidding! Probably the feature that every developer will first notice and appreciate is the mutiple-screen layout preview. 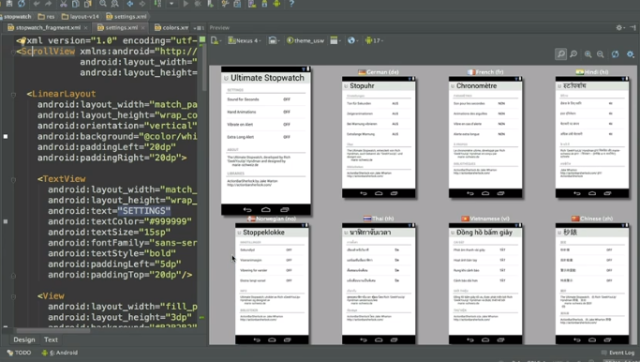 This allows the dev to immediately see an app's UI simulated across many differently-sized devices at once -- handy! Having wrangled with targeting differently-sized target devices myself I'm certain that this feature alone would be enough to draw many Eclipse developers over to Android Studio.